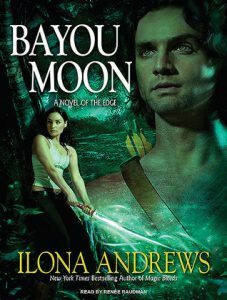 I borrowed audio versions of both On the Edge and Bayou Moon from Hoopla. 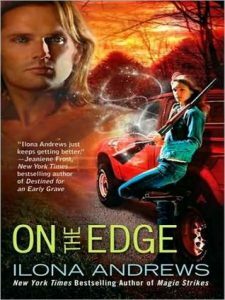 They’re written by Ilona Andrews and read by Renée Raudman. I went back and forwards with this book, sometimes really liking it and sometimes rolling my eyes. I absolutely liked Rose. She’s awesome, honestly. And I didn’t dislike Declan. I appreciated that, as Andrews so often does, he was a hero unafraid to let his heroine take risks and shine. There was none of the abuser discussed as an alpha romantic partner that I dislike in the PNR/UF genres. But I also never really came to love him either. He was too perfect and more of a caricature than a character. Also too perfect was the sappy, unnecessary ending. I know it sounds like I didn’t like the book, but I really did. I just never loved it. As a series though, I can see myself wanting to read all of them. I feel the same way about the Kate Daniels books. Individually I always rate them middle of the road, but I want to read them all because I love the world. I had the audio version and the narrator did an excellent job. I thought Declan sounded too old for the age he was supposed to be, but that was my only complaint. She really did an unusually good job. This was a solid 3 stars. I enjoyed it a lot, but wouldn’t go so far as to say I loved it. I thought William was absolutely adorable, Cerise was wonderfully badass and the Mar family was a great bunch of side characters. But I also thought it overly long, the ending a bit rushed (as in all wrapped up a little too easily) and I didn’t need the sappiness at the end. I listened to this in audio and thought the narrator did an excellent job, much like in book one. This entry was posted in books/book review and tagged audio book, book review, fantasy, shifters on November 30, 2017 by Sadie. I visited my aunt and uncle in Tennessee this Thanksgiving. That’s a six hour drive from my house, plus a four day visit and a six hour drive home. As my husband is one of those men who insists on always driving, that meant I got lots of reading time in. But while rural Tennessee is beautiful and we couldn’t have gotten better weather, the internet connection is sketchy, at best. So, I opted to save all my reviews for one post once I got home, instead of the normal one post per book. This is that post. I’ll give each a little review below; but as you can maybe see from the books I chose, I was going for base enjoyment. St. Nacho’s was the winner of the bunch and Misbehaving ranked bottom of the pack, closely followed by Undaunted. Leaving Jarek, Hell is Where the Heart is and Submerging Inferno lingering in the middle somewhere, neither wowing me nor leaving me cringing to admit I read them. This was one of those books in which everyone is just so darned lovely you can’t stand it. People make instant connections, earn trust in no time, love blooms easily, and EVERYONE lives happily ever after together. The writing was ok, though the dialogue didn’t feel particularly natural, at times. But the pacing felt off and I didn’t believe the relationships for a moment. I think you kind of have to be invested in the Mars Needs Women trope to enjoy this, it’s just so pared down. Unless you already know what to expect from the genre, you might not feel satisfied with this. Mars Needs Women is one of my guilty pleasures. I generally find them cheesy fun and this one was no different. There just isn’t a lot to it and what there is is diluted by a lot of outside drama and it felt like it might be part of a spin-off series, as there was a lot of history discussed. It wasn’t bad, but certainly wasn’t one of my favorite to use the trope. Bad, just bad. It jumps around, the pacing is a mess and it needs an editor. But what really ruined it is that it’s literally like 95% dialogue. It’s really hard to make a novel work when it is all dialogue, and not even good dialogue. Mallory didn’t manage it. Slow and heavy, but good. I’ll admit that the beginning of this book left me confused, but once it found its groove I thought it really pretty. I liked that Maxfield messed with expectations in Cooper and Shawn’s relationship and Shawn was just a truly lovely character. The book did break my hear a little bit. I’d love to read Jordan’s book, which I think is #2 and Kevin’s, which I don’t think exists. I was tempted to write this book off as absolutely ridiculous, but honestly that’s its whole point. It is ridiculous, but it laughs at itself and I found the whole think amusing in a silly sort of way. Not too bad. A bit repetitive, the middle dragged a bit, I didn’t really buy Brett ‘s decisions, and it ended just about the time it got most interesting, but not bad. It has an interesting plot, two likable heroes and a diverse cast. This entry was posted in books/book review and tagged #DiverseRomanceBingo, #ReadDiverse2017, book review, fantasy, M/M, magic, romance, shifters on November 27, 2017 by Sadie. 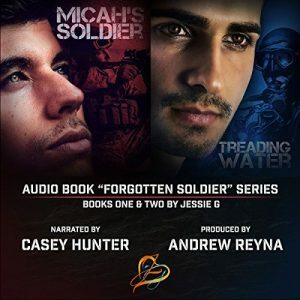 Review of Treading Water (Forgotten Soldier #1), by Jessie G.
I received an Audible copy of Treading Water from the author, Jessie G.
After devoting eighteen years of his life to the US Navy, Petty Officer First Class Shane Parker is struggling with the very real possibility of becoming unnecessary. If he doesn’t make Chief Petty Officer before his twenty—and it doesn’t seem likely that he will—he’ll be retired from active service and placed on the Fleet Reserve list until his mooring lines are officially cut forever. While it would all be very honorable and ceremonial, he simply wasn’t civilian material. Before even swearing-in, Julian Brand knew he wasn’t cut out to be a soldier, but refusing wasn’t an option. Generations of Brand man made careers in the military and the expectation of every Brand son was to follow in those prestigious footsteps. Though the prospect of being rolled back hindered his every step, he survived Battle Stations and did his time. Six years out of uniform and Julian still struggles to find familial acceptance as he fights to live life on his terms. On the surface, they couldn’t be more different, but when Jared Ramos calls, neither are capable of refusing. If they can find a way to work together, they might be able to save a friend and each other in the process. I read Micah’s Soldier at the tail end of 2015. About it I said, “Not particularly deep, but well developed for something so short. It’s also very sweet.” So when I saw an audio version of the sequel available I was happy to give it a go. I had a mixed experience with Treading Water. I really thought Shane and Julian were a cute couple and I liked the way their relationship progressed. I thought the writing was pretty good and I liked that injured soldiers were shown to have lives even after injury. This was all good. But I struggled with having five first person POVs and with Shawn as a character. (Well, I struggled keeping Shawn and Shane straight in general. Why are the names so similar?) But I had some difficulty because his injury is what holds the whole book together; it’s the reason Shane and Julian meet at all and why they spend time together. But Since Shane and Julian are the main characters, it left Shawn and his traumatic injury feeling a bit like a storytelling prop. About the narrator, Casey Hunter…I hate to say it, but he didn’t do a very good job. (Though it did improve as the book went on.) His voice was easy to listen to, but the timing was off in so many ways. There were extra long pauses where you wouldn’t expect them, like in the middle of a sentence, and almost no pauses where you would, like between chapters. There were times I was honestly left confused about who was saying what or that we’d moved on to a new character or section. I don’t know how audiobooks are produced. Maybe this should be put on the shoulders of the producer, not the narrator. Because, as I said, his voice and intonations was fine. But the timing issues definitely effected my listening experience. All in all, I’d be willing to read more by Jessie G. and that’s really what I judge an author by in the end. This entry was posted in books/book review and tagged audio book, book review, M/M, romance on November 21, 2017 by Sadie.